Does it make you nutsy when you want to know more about something really interesting on Instagram and the account’s profile link simply dumps you on the main page of a web site or blog, with no sign of what you’re looking for? Worse yet, is when the site has no search features. It frustrates me and I’m sure it frustrates others. I was prepping for a Social Media & Marketing workshop today and checking library Instagram accounts, when it struck me how easily this can be solved with a dedicated Instagram landing page on the library website. Pop your Instagram images on to the page and link them to the service or event that they’re promoting. Customers find what they’re looking for and bonus points for being able to easily track Instagram referrals to your website via Google Analytics. Of course, I realized that this probably wasn’t a new idea. Sure enough, a quick search showed me that the home/crafts/cooking bloggers are all over this. Smart cookies. :)Â But I haven’t found any libraries yet. Please let me know if your library is doing this. If you’re a blogger, make sure you have great images for each post. Use those images to promote your posts on Instagram. Create a unique page to serve as your Instagram landing page. Add a ‘welcome’ of some sort to the page. Maybe add some links to the important sections of your site. Then add each of the blog posts & images that you’ve promoted on Instagram, with links back to the content. Update your Instagram profile with the URL of your new Instagram landing page! Add a ‘welcome’ of some sort. Provide links to the major sections of your site. *Download your Instagram images that promote content on your website. Upload them to the Instagram landing page and link them to the pages on your website where people can find more info. *Downloading images directly from Instagram is a pain. But with a free Instagram viewing tool like Websta or Iconosquare, you can just right-click and save the images. Make sure you’re viewing a large, good quality image when you do that. The tiny thumbnail versions won’t look good on your website. If you use Google Analytics to track use of your website, you can now easily track traffic from Instagram to your site. Clicks directly from your Instagram profile will end up as data in the Landing Pages section of Google Analytics. Check for that information under Behaviour –> Site Content –> Landing Pages. 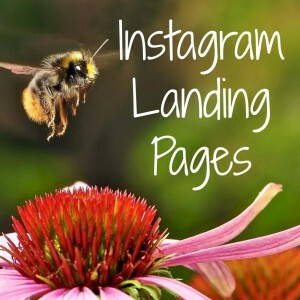 Landing pages work well for other social media, promotions, contests, etc as well. Keep that in mind when you’re trying to drive traffic to your web site. Landing Page 101 provides a nice introduction to this topic.